A decade or 2 from today, Kolkata may become a city where commuters may depend less on errant road transport system like one now finds. 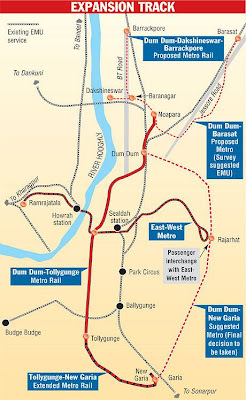 Metro may have started in Kolkata in 1984, but its route never extended beyond Dum Dum in the north, and Tollygunge to the south. This is about to change when Tollygunge will give way to Garia as the southernmost destination. There will be further change when the East-West Metro takes shape from Salt Lake to Howrah passing below the river Hooghly. But all that may look like blips once the massive network of Metro being planned over the entire city actually happens on ground. The 1982 Asian Games brought a major facelift to the capital. And now the 2011 Commonwealth Games is seeing frenzied expansion of the metro in Delhi. Kolkata is singularly unlucky for various reasons. The proposed Metro network encircling the city will therefore be a big boost. See the picture below, taken from The Telegraph. Like this blog? Get daily posts by email. Partha Bhattacharya is a coach and consultant for online course development and web content solutions. He is also the founder of HubSkills.Com.